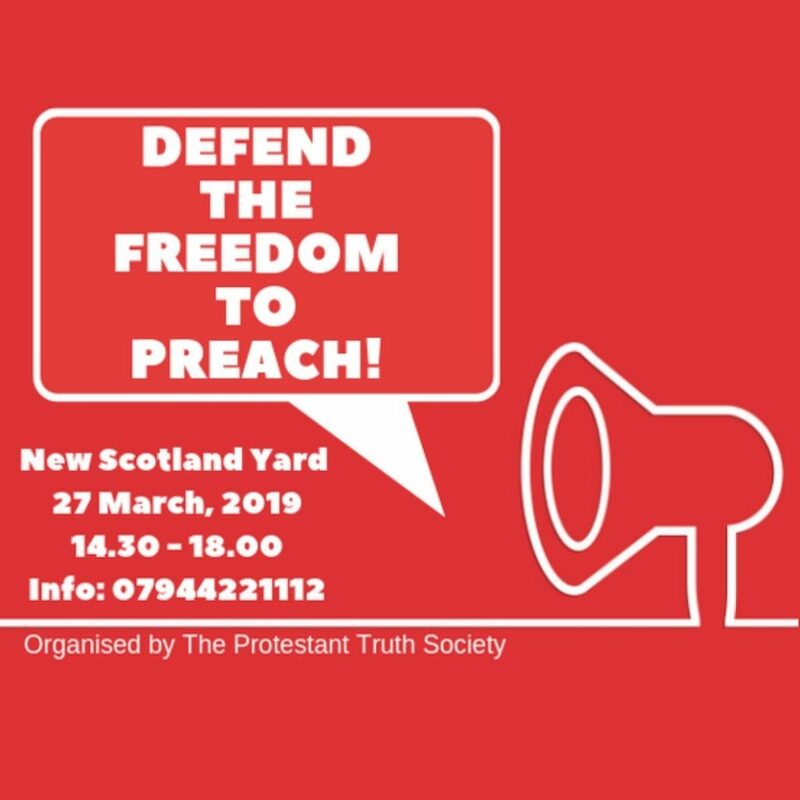 On March 27, 2019 a number of Christians gathered outside New Scotland Yard in a witness organized by The Protestant Truth Society. There is a long tradition of public preaching in this country which must be upheld and which the police should respect. Their powers of arrest are currently being abused. Merely saying that homosexuality is a sin, or that Islam is not a true religion, are not grounds for arrest. 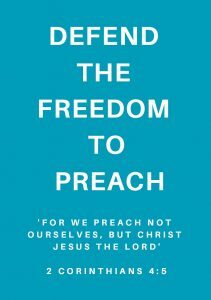 Christians are commanded to ‘preach the gospel in season and out of season’. This Christian witness has been a great blessing to our troubled nation. True peace, for people and nations, can only be found in the God who made us. And we can only come to know Him through repentance and faith in His Son Jesus Christ, ‘the Prince of Peace’. These great truths must be heard. On Wednesday, March 27, a small group of Christians gathered in front of the imposing building ‘New Scotland Yard’. 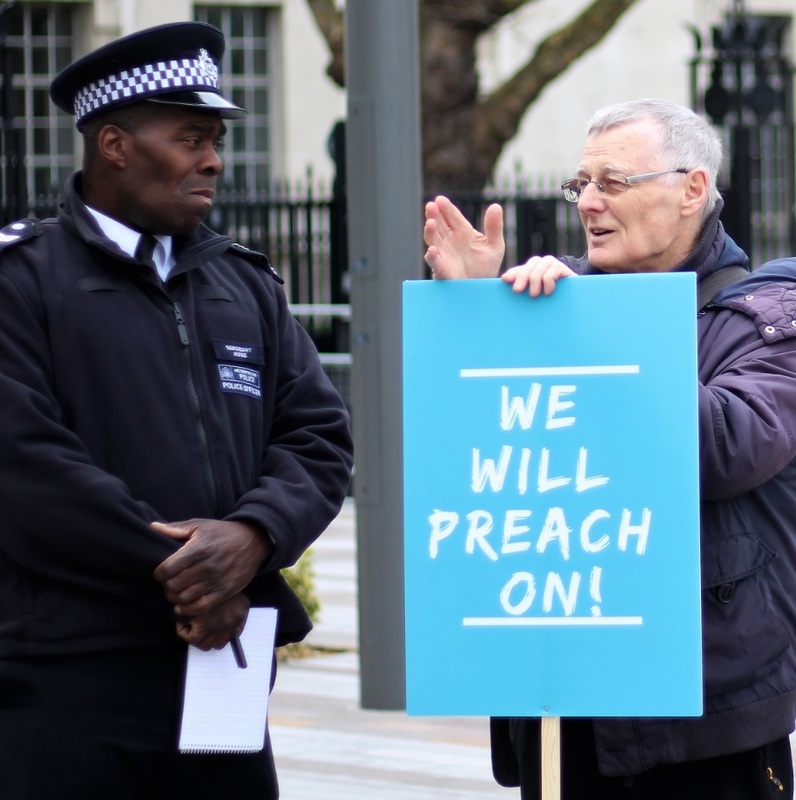 Our intention was to highlight the way in which Christian street preachers are treated in a way inconsistent with the way the police treat preachers of other religions – notably Islam. We wished to convey our dismay at this, in what is nominally a Christian country, and protest against it. For most of the day our numbers were exceeded by the numbers of police on hand – not only were there at least 7 officers watching us, plus two armed officers, there was also at least one van full of officers on the other side of the road for almost the entire time we were there. It was intimidating, and many would have found it difficult just being there, let alone handing out leaflets and preaching. After the chairman began with prayer, and the reading of John 1:1-18. Following this the witness began. Four men preached, Rev. Peter Simpson, Rev. Regan King, Mr Andrew Price and Mr Mike Overd. Others handed out leaflets and tracts. Many conversations were entered into with passers-by, only a small number of whom were openly hostile. The chairman spent the afternoon holding placards so they could be read by those driving past. Some of those wound down their windows and listened in to the preaching whilst they waited in the inevitable London jams. Though many in number the police were polite – we pray they listened to, and heard what was said. One moment of note. 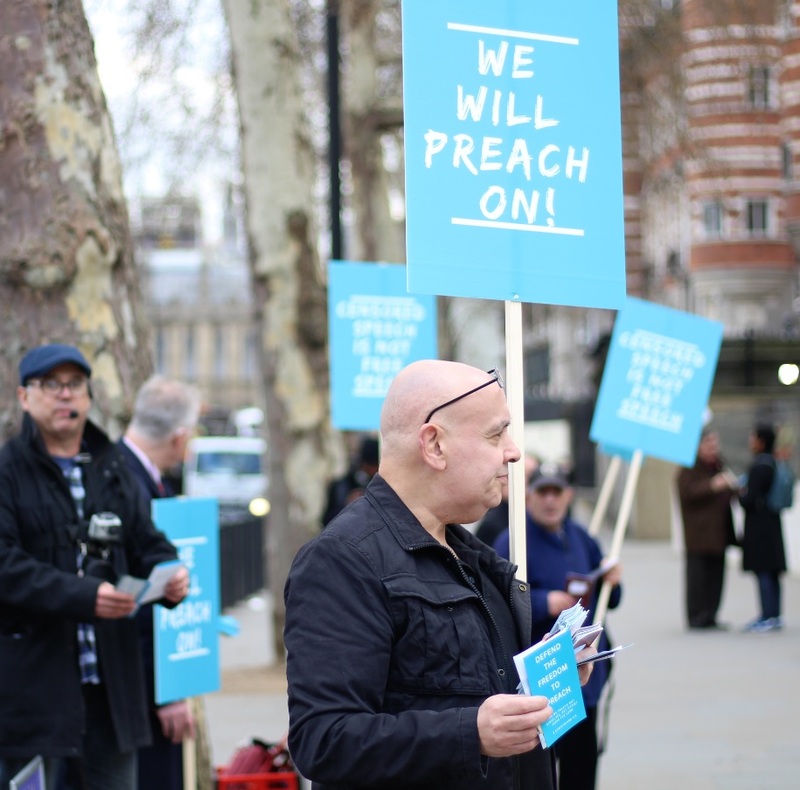 A coach driver hurried across to us and asked, ‘Are you protesting about the preacher who was arrested and dragged off the other day?’ ‘Yes’, we replied. “Thank you”, he said, “I’d stay, but my passengers are just coming back.” We thanked him for his support, and were grateful that he made the effort to come across, even for a moment. We thank God for the afternoon, and pray for the courage to grasp future opportunities to stand up for the place of the gospel in public life. Please let us know if you would like to be informed of similar events in the future. 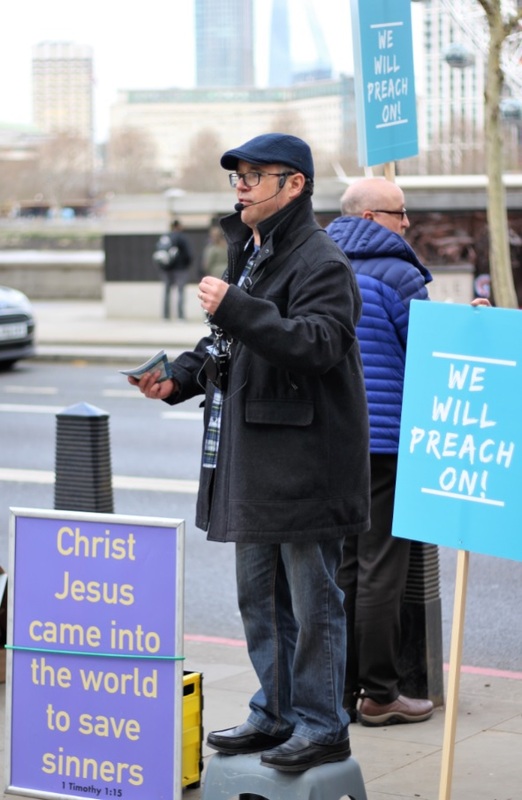 It is becoming increasingly commonplace for street preachers and those involved in evangelism to come under attack or harassment by local authorities. The Protestant Truth Society is organizing a witness to Christ and to remind relevant authorities of the legal freedoms we have to proclaim Jesus Christ. This witness is scheduled to take place outside New Scotland Yard, Victoria Embankment, London, SW1A 2JL on Wednesday, 27 March 2019 at 2.30pm until 6.30pm. Click on the image below to download the leaflet. The witness will include some street preaching. We have formally notified the police of the time and place of this witness. This popular Christian Diary is now in its 101st year of publication. It includes a text for each day (AV) as well as devotional pages. Containing 96 pages, it has a laminated cover, available in a choice of two pictorial designs. The Protestant Truth Society exists to assist Christians and churches to stand for the truth in all its glory and against error in all its forms. The Director of Ministry is responsible to the Council for all aspects of the spiritual work of the Society. He leads the team of Wickliffe Preachers, edits the bi-monthly magazine Protestant Truth, and represents the Society among churches as well as to politicians and the media. His itinerant ministry includes regular teaching on distinctly Protestant themes. It is expected that candidates will be recognised ministers with strong preaching gifts and some pastoral experience. They must be willing to travel and able to work on their own initiative. In return, the successful applicant will receive a competitive salary, expenses, and appropriate benefits. This popular Christian Diary is now in its 99th year of publication. It includes a text for each day (AV) as well as devotional pages. Please order by post, telephone or click here to e-mail us.